There are people the world over who have real problems, I know, but one of the classic, quintessential housewife stresses is figuring out, night after night, what to cook for dinner. When the menfolk (or amazon warrior priestesses) come back from the battlefields of their cubicles, they deserve a meal fit for the conquering heroes that they are. And even though I work from home, right around this time of the afternoon each day, my mind starts to wander from my real work to my housework. If, like me, you find yourself struggling to invent new ways to cook chicken or make the same kind of pasta three nights a week, maybe it's time to look elsewhere for inspiration. Like, somewhere earlier. Do you know what makes a good dinner? Breakfast. Think about it- if breakfast foods are delicious and nutritious enough for the most important meal of the day, they will most certainly do for what is arguably the second- or third-most important one. If you're feeling theme-y, feel free to put on your pjs and eat dinner in bed - I'm not gonna stop you. Frittata: My sister-in-law's mom makes a frittata for my baby niece that is absolutely delicious, and inspired me to make my own at home. (Oh, come, on- she's just a little baby, she didn't need the whole frittata). Here's a great recipe. Eggs and Toast: Poach the eggs in tomato sauce, and top with Parmesan cheese and suddenly a breakfast staple is a delicious dinner. 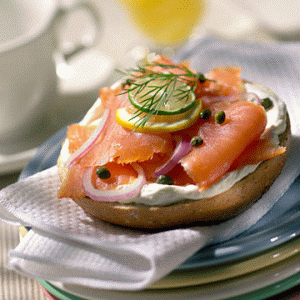 Bagels with Lox: You can pick this up at the bagel spot on your way home. It's basically just a salmon sandwich, when you think about it. Waffles or Pancakes: If you've got a box of Bisquick, you've got dinner. Omelets: So simple and so good. Any time of day. Julia shows you how here. Sausage: I've recently discovered these incredible organic chicken sausages. I would eat them on a house. I would eat them with a mouse. I would eat them with a fox. I would eat them in a box. Huevos Rancheros: Fry an egg, and serve it (to yourself, or your valiant knight), with warm flour tortillas, black beans, cheese, salsa and avocado. Heaven. Er, cielo. And when all else fails... Cereal. Unfortunately, neither of my brats (they're teenagers so they really are brats!) like breakfast food. Although I secretly think they love it--they just love torturing me more! Love your blog!! I'm following you so I can come back and find out exactly what to do to make that chicken look different! I love breakfast foods for dinner. Bagels with lox are the best!! My kids and we all enjoy breakfast for dinner! My hubby's mom, whom I love, makes a special egg casserole ONLY at Christmas. I got the recipe, and now I make it all the time, but especially for dinner because it takes a while to bake and we don't get up that early! :) It's always a hit, with sausages or bacon, and maybe some toast on the side (because my kids won't eat eggs yet, they're still little and picky).